QAMISHLI, Syria , Oct 25 2013 (IPS) - Kurdish fighters have emerged as a powerful player in the Syrian war thanks to the Yekîneyên Parastina Gel (YPG – “People’s Protection Units”), a seemingly well-organised armed group which has so far proved capable of defending the territory it claims in northern Syria. 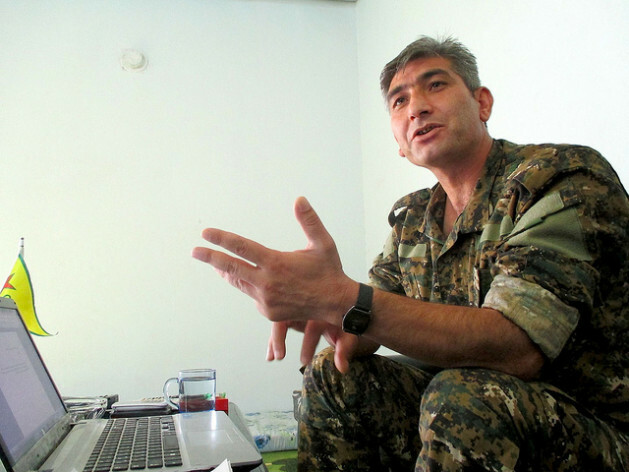 IPS spoke to Redur Khalil at YPG headquarters in Qamishli in northeast Syria. A former Kurdistan Workers’ Party (PKK) fighter with ten years of experience, Khalil – considered the public face of Kurdish resistance in Syria – has been a senior officer in the YPG since the start of the Syrian war. About 40 million Kurds comprise today’s largest stateless nation. Numbering around three million in Syria, they are the biggest minority in the country, as many as the Alawites, the ethno-religious group of Syrian President Bashar al-Assad. Kurds are still in control of their areas in northern Syria, in a precarious balance between the Free Syrian Army (FSA) and Assad’s army. Nonetheless, the biggest threat towards stability in the areas where they are concentrated is posed by groups linked to Al Qaeda, several of which are allegedly backed by Turkey. Q: What´s the current security situation in Kurdish-controlled areas? A: Since Jul. 16 our forces have been constantly engaging in clashes with Al Qaeda-linked groups like Jabhat al Nusra and, especially, the ISIS – Islamic State of Iraq and the Levant – all across our territory. These terrorist groups have not only killed and abducted Kurdish people and displaced civilians from their villages but also looted their properties, homes and places of work. After heavy clashes in areas like Afrin, 340 km north of Damascus, and Serekaniye, 506 km north of Damascus, we have pushed them down to Til Kocer, 840 km northeast of Damascus on the Syria-Iraq border. Q: Many claim that Turkey has been funnelling jihadist cells across their border. What´s your take on that? A: There´s no doubt about it. A few days ago we spotted them again coming from the Turkish border and we´ve even been attacked by Turkish artillery from their side. Two of our fighters were killed by gunfire from Turkish soldiers on the other side. But we also have a huge collection of IDs that belonged to fighters coming from Egypt, Tunisia, Bahrein… Many from Iraq and, so far, three from Turkey [he produces a pile of ID cards]. Q: But Assad´s presence in your areas is almost anecdotic. Why is there such a big presence of foreign fighters in the area? A: It´s an unfortunate convergence of two agendas: Turkish chauvinism, which wants to boycott any step towards the recognition of the Kurdish people in Syria or elsewhere, and the Arab Islamists’ dream of an Islamic state. We Kurds are caught in between those plans; we´re very much an obstacle for them so it´s actually us, and not the regime, that they´re fighting against now. We have suffered over 20 suicide attacks in the last 20 months. Other than the foreigners, Assad also released prisoners from all over the country. Were it not for the Jihadists, the regime would have been toppled long ago. Q: Do you have communication of any kind with such groups? And with Assad’s forces? A: A few days ago we released some of their prisoners in exchange for the bodies of our martyrs. That´s all. As YPG we have no communication whatsoever with the Assad regime. Q: Rumour has it that PKK fighters are flocking into Syria´s Kurdish areas to join your ranks. A: It´s not true. Besides, we´re not waiting for them because we have clearly proved that we can manage the situation by ourselves. We have an army of 45,000 fighters, who have all gone through a 45-day training programme in the several camps across the Kurdish areas. Q: Nonetheless, the PJAK – PKK’s counterpart in Iranian-controlled Kurdistan – has publicly said it wants to come and fight alongside your troops. A: They are prepared to send their fighters, but as I said, we can handle the situation without any extra help. Both PKK and PJAK are welcome if they want to come, but for the time being we don´t really need them. Q: Are there any non-Kurds within your ranks? A: Indeed. A number of Arabs, Assyrians and Turkmens have joined us as well as men and women from all walks of life. Thirty-five percent of our fighters are women. We have lived together for centuries and they are an integral part of Kurdistan just as the Kurds are. YPG’s mission is to protect Western Kurdistan and all of its ethnic, national, and religious components. Q: But there are also allegations that YPG is recruiting children. A: Recruitment of conscripts under the legal age is completely rejected, it´s unacceptable and prohibited by the rules and regulations in force in this area. Unfortunately, this did not prevent a few who did join voluntarily under the pressure of circumstances and through the neglect of some. In those few cases they were not allowed to participate in military operations and were not deployed in ‘hot’ areas. What I want to underline is that it was only actions of individuals, not of the system or the organisation as a whole. Q: Kurdish opposition parties have accused you of indiscriminate use of force against protesters in the town of Amude, which resulted in the death of three activists last June. A: We have videos, photos and documents that show that what happened in Amude was part of a conspiracy. Gunmen joined those protests and did not hesitate to shoot at a YPG convoy returning from a combat operation in the outskirts of Hasakah, 550 km northeast of Damascus. A member of the YPG, Sabri Gulo, was killed in that attack and two other fighters were injured. Q: Where do you get funds and supplies? A: We get support from the Kurdish Supreme Committee as well as from taxes collected at the borders under our control. Q: Jabhat al-Akrad is also a Kurdish armed unit but not fighting alongside the YPG. What´s your relationship, if any, with them? A: Jabhat al-Akrad was set up as a Kurdish unit that joined the FSA in Aleppo. But they´ve even engaged in clashes with them, when the Arab opposition attacked Kurdish areas. They´re also committed to the defence of the Kurdish land. Q: How do you see the peace process between Ankara and Turkey´s Kurds? A: As usual, the Kurdish side has moved forward whereas the Turks haven´t lifted a finger yet. Despite the obstacles, I strongly believe that peace will finally come and that issues between both sides will be settled. It´s not just one side but Turkish society as a whole that is demanding it. It may take longer than expected but I´m sure it will finally happen. I learned a year ago from following IPS news that the Kurds were being targeted as the war in Syria stayed in crisis. This news is an answer to my prayer that they would not face any harm and would be able to form a resistance to the terror cells. Your life can be a huge price to pay for freedom from terrorists and religious fanatics (Islamists), but I continue to pray that God will protect ‘freedom fighters’ and the ‘innocents’ in Syria. Thank you IPS for sharing this article. Blessings and peace to Syria’s people.